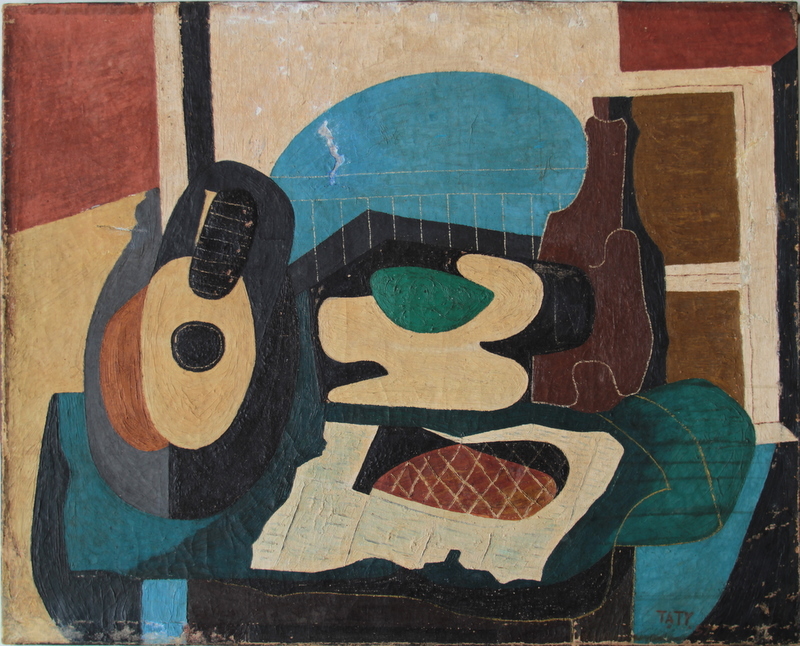 The Guitar is a cubist oil painting on canvas. It was painted by Tạ Tỵ in 1957, and was purchased by Witness Collection at auction in France in 2009. Prior to entering the collection, the painting had undergone extensive restoration. 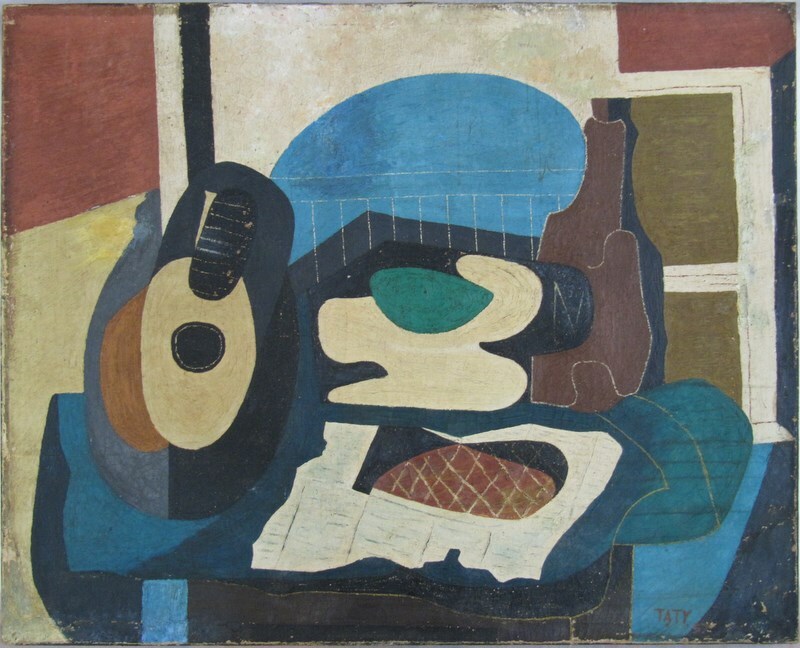 Tạ Tỵ (1922-2004) is known as Vietnam’s leading proponent of cubism and abstraction. Large areas of the painting were covered in unsightly overpaint which was not suitably colour-matched to the surrounding original paint. In addition, the overpaint concealed and altered the original brushstrokes. 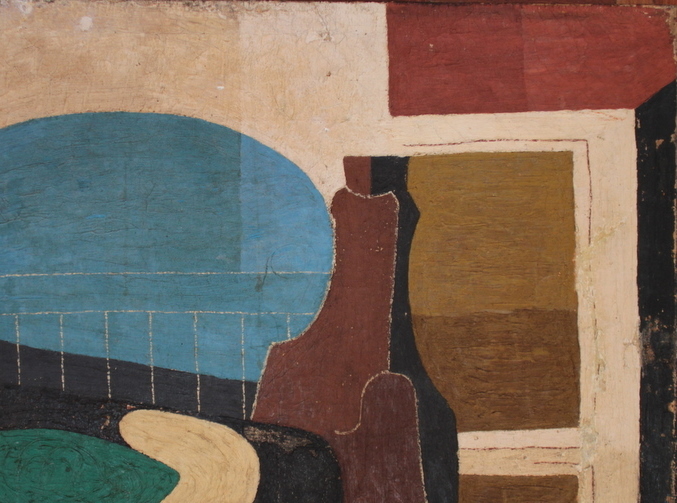 Since the composition consisted of large flat colour fields, the areas of overpaint were particularly disfiguring. 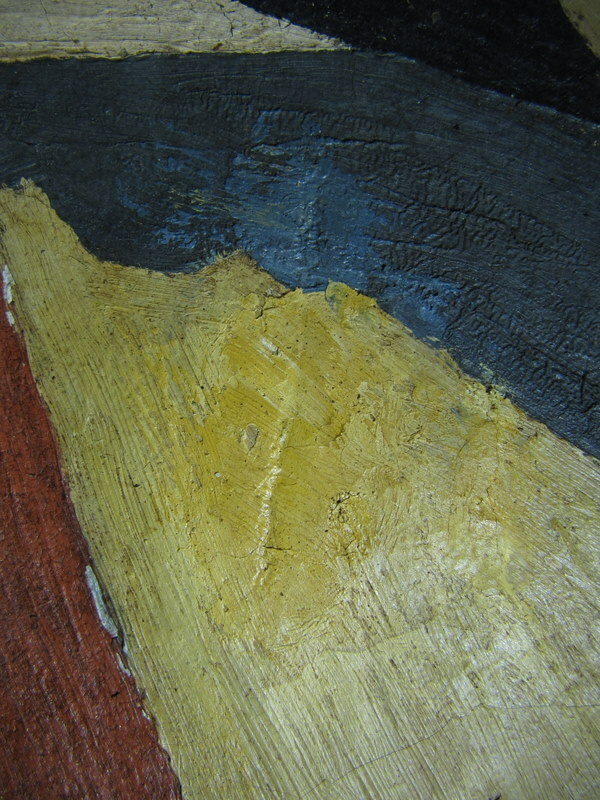 One area covered a tear in the canvas which had been repaired across the yellow and grey colour fields on the left hand side of the composition. A large blue area of overpaint was concentrated on the left of the pale blue oval. Almost the entire cream area at the top of the composition was overpainted. The bottom left of the canvas consisted of overpaint applied directly onto the bare canvas over areas of former paint loss. Black parts of the composition were also covered in overpaint in many different areas. To a large extent, the condition of the underlying original paint could not be ascertained without removal of the overpaint. Overpaint along the right vertical, in the cream colour field, included large amounts of sand particles and grit scattered into the wet overpaint, possibly to recreate an aged appearance. The tear was still very visible since the edges had not been brought into plane or realigned, resulting in surface deformations. Remainders of a discoloured varnish layer were located along the edges of the composition, while surface dirt was present on the majority of the painting, changing the tonal balance. The original auxiliary support had been replaced with a strainer onto which the painting was stretched. The brittle canvas was severely discoloured to brown, with numerous stains visible on the verso. Many areas of paint loss had occurred, and the remaining paint was brittle and fragile, with numerous loose flakes and an extensive network of age cracks. On a microscopic level, the surface of the original paint could be seen to be breaking up and very brittle, with micro fissures and raised or flaking areas. A non-original varnish layer had been applied which did not form a continuous layer, but was only present as small droplets in some areas, while forming a fine film in other areas. After initial moisture and solvent tests, overpaint was removed. Overpaint removal once again revealed brush strokes where they were previously not visible. 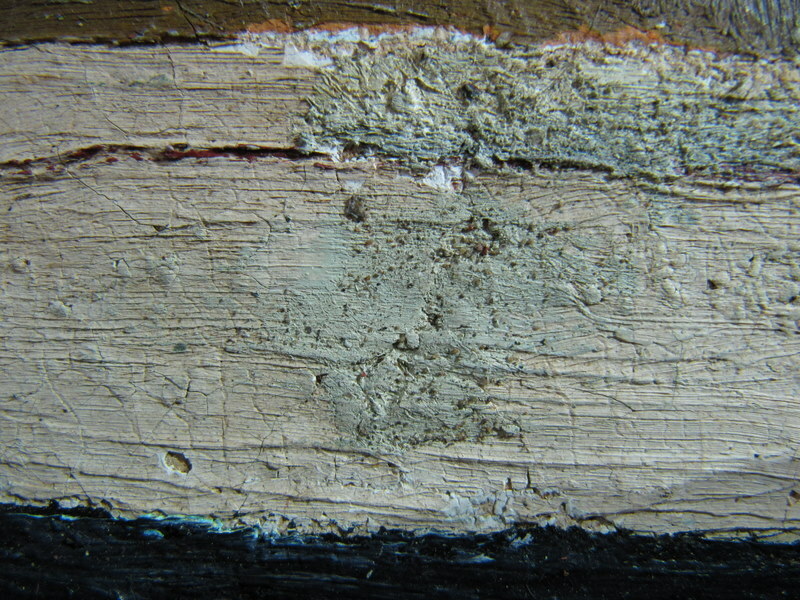 Overpaint was found to cover age cracks and areas of loss or damage, especially around the edges of the composition. The thickness of the overpaint made it difficult to determine the extent of damage prior to overpaint removal. Large areas of overpaint were found to cover areas of original paint that were undamaged or had only suffered very minor paint loss. In some colour fields, the overpaint had stained or darkened the original paint. Following overpaint removal, the non-original surface coating was also removed. Flaking paint was effectively consolidated using a solution of fish glue. After extensive tests to determine a suitable dirt removal method, a gel was made up. This was applied to the surface by brush and left on for a short period of time before being removed. This method effectively removed the stubborn dirt layer over the entire painting. Depending on the extent of soiling and sensitivity of the paint layers, the manner of application was varied slightly. Subsequent treatment steps will include structural treatment of planar deformations, filling and retouching of losses.